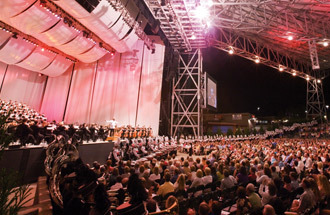 In 2008, Alpharetta had another terrific addition with The Verizon Wireless Amphitheater at Encore Park. Having a gorgeous venue right here allows locals to enjoy great shows without having to deal with the drive and parking of going all the way into downtown Atlanta. This fantastic 12,000 seat outdoor venue features concerts, community events, movie nights and more. It's certainly nice to enjoy the great sounds from some of the biggest musical acts in America so close to home. Verizon Amphitheater at Encore Park is a 45 acre outdoor facility with open air stage, and seats 12,000 total spectators with 7,000 protected by a roof and another 5,000 on the Superior Lawn area. This beautifully landscaped venue is easily one of the nicest open air facilities in metro Atlanta, bringing top name bands and artists and drawing ticket purchasers from all over the southeast and beyond.